Saint Irene (Greek: Ειρήνη, Eirēnē) (c. 752 – August 9, 803) was Byzantine empress from 797 to 802. 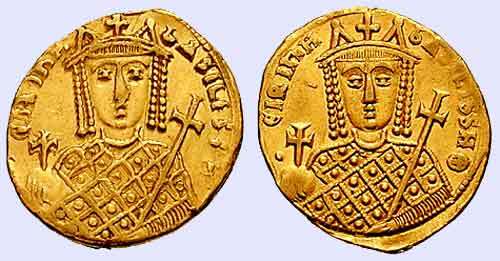 As monarch she called herself basileus (βασιλεύς), "emperor", rather than basilissa (βασίλισσα), "empress". Originally a poor but beautiful Athenian orphan, she was brought to Constantinople by Emperor Constantine V and married his son and co-ruler Leo IV in 769. In 771 she gave birth to a son, the future Constantine VI. According to tradition, her husband discovered icons concealed among Irene's possessions and refused to share the marriage bed with her ever after. Nevertheless, when he died prematurely in 780, he left her as sole guardian of the Byzantine Empire and the ten-year-old Constantine VI. Irene was almost immediately confronted with a conspiracy to raise to the throne the Caesar Nikephoros, a half-brother of Leo IV. Overcoming this challenge, Irene next had to subdue a rebellion led by Elpidios, the governor of Sicily. A first fleet sent against him was defeated in 781, but the second succeeded in driving the rebels into Africa in 782. As early as 781 Irene began to seek a closer relationship with the Carolingians and the Papacy. She negotiated a marriage between her son and Rotrude, a daughter of Charlemagne by his third wife Hildegard. Irene went as far as to send an official to instruct the Frankish princess in Greek; however, Irene herself broke off the engagement in 787, against her son's wishes. While this improved relations with the Papacy, it did not prevent the outbreak of a war with the Franks, who took over Istria and Benevento in 788. In spite of these reverses Irene's military efforts occasionally met with success: in 782 her courtier Staurakios subdued the Slavs of Macedonia and Greece and laid the foundations of Byzantine expansion and re-Hellenization in the Balkans. Nevertheless, Irene was constantly harried by the Abbasids, and in 782 and 798 had to accept the terms of the respective Caliphs Al-Mahdi and Harun al-Rashid. As Constantine approached maturity he began to grow restive under her autocratic sway. An attempt to free himself by force was met and crushed by the empress, who demanded that the oath of fidelity should thenceforward be taken in her name alone. The discontent which this occasioned swelled in 790 into open resistance, and the soldiers, headed by the Armenian guard, formally proclaimed Constantine VI as the sole ruler. A hollow semblance of friendship was maintained between Constantine and Irene, whose title of empress was confirmed in 792; but the rival factions remained, and Irene, by skillful intrigues with the bishops and courtiers, organized a powerful conspiracy on her own behalf. Constantine could only flee for aid to the provinces, but even there he was surrounded by participants in the plot. Seized by his attendants on the Asiatic shore of the Bosphorus, the emperor was carried back to the palace at Constantinople; and there, by the orders of his mother, his eyes were gouged out. He later died from his wounds. A solar eclipse and a darkness of 17 days' duration were attributed by the common superstition to the horror of heaven. However, modern research suggests that Constantine's wounds were not fatal and that he actually outlived his mother. Irene reigned for five years, from 797 to 802. Pope Leo III, who needed help against enemies in Rome and who saw the throne of the Byzantine emperor as vacant (lacking a male occupant), crowned Charlemagne as Roman Emperor in 800. This was seen as an insult to Byzantium and the Orthodox Church and caused another rift between the Eastern Orthodox Church and the Roman Catholic Church. Nevertheless, Irene is said to have endeavoured to negotiate a marriage between herself and Charlemagne; but according to Theophanes the Confessor, who alone mentions it, the scheme was frustrated by Aetios, one of her favourites. In 802 the patricians conspired against her and placed on the throne Nikephoros, the minister (logothetēs) of finance. The haughty and unscrupulous princess, "who never lost sight of political power in the height of her religious zeal," was exiled to Lesbos and forced to support herself by spinning. She died the following year. Her zeal in restoring images and monasteries has given her a place among the saints of the Eastern Orthodox Church. Constantine VI, whom she succeeded on the throne.